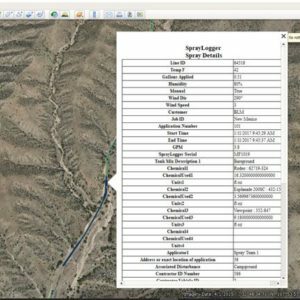 SprayLogger Automated Pesticide Application Mapping - AgTerra Technologies, Inc.
SprayLogger works with MapItFast and Strider to provide you a complete pesticide application mapping and reporting solution. Map all spray and no-spray activity in real-time with location and time. Automatically capture exact area, targets, chemical amount and type from one or many tanks, spray sections, nozzles and more. Automated GPS Spray Tracking and Reporting Made Even Simpler! The SprayLogger E3B is the perfect combination of functionality and portability. This SprayLogger’s multi-port tracking system allows applicators to automatically read multiple flow sensors from different spray sections while also tracking the activation of individual nozzles. Whether you need to track and map a single flow line or multiple spray sections and nozzles, the SprayLogger E3B does it. The SprayLogger “Fast Start” menu lets spray applicators start a job by only answering 5 simple questions on their Android mobile device, from there SprayLogger does the rest. 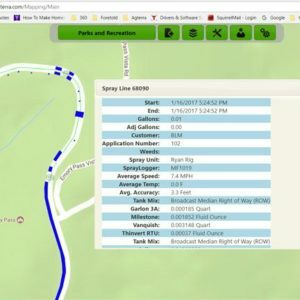 All application details will automatically be tracked and a map created showing what spray sections were activated, and when and where they sprayed. With an internal high accuracy GPS antenna, you will also get better maps that show your exact application location details. Combined with automatic cloud storage, your projects will be available for printing when you pull into the shop. No more paper reports to fill out by hand, simply download your reports and maps from your online account. The SprayLogger E3B by AgTerra gives you More Spray Time and Less Desk Time! Spray away. A long way away! SprayLogger is designed to work in the most remote areas utilizing the free GPS services that come included with your Android mobile device, even without a data connection. Whether that job in the back country has you on a hose reel or a backpack, SprayLogger stores data and maps every application on your device until you re-establish a data connection. Then, everything is automatically uploaded to your private account. There is no manual data transfer required. SprayLogger enables you to exceed expectations by delivering professional maps and reports for your spray jobs with very little effort. Furthermore, you create efficiencies in your own operation when you are able to measure chemical usage, costs and other information while managing workflow and personnel at the same time. Map spray and no-spray applications for every spray job in real time. Capture details including the exact amount of active ingredient applied. Log spray width and location for tanks, sections, nozzles, and even hose reels. Filter and report by date, target pests, chemical, customer, applicator and spray rig. Export to database or GIS formats including CSV, KMZ and SHP. 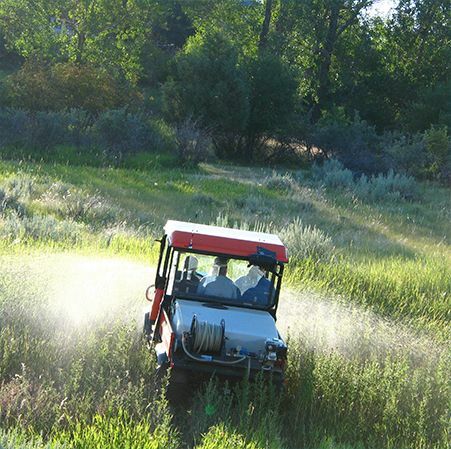 Use with low volume, high volume and variable rate applications on a wide variety of sprayers, inlcuding UTV, truck, hy-rail, watercraft, foggers and backpacks. 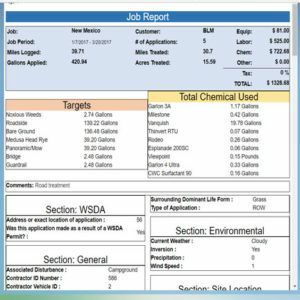 Create monthly and yearly detailed summary reports for every job showing total gallons, acres, chemicals used, and more for every customer. Generate professional reports with a business logo, complete application details, time, costs, detailed weather, applicators, signatures and a spray map. 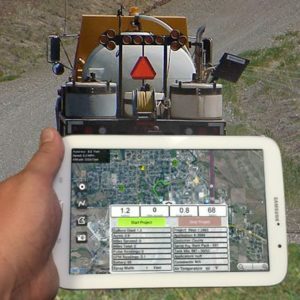 A live, web-based mapping console allows authorized people to view jobs and spray rig locations in real time. In addition, data and reports may be exported to commonly-used database and GIS formats for use in other software programs such as ArcGIS. and reporting work to us. 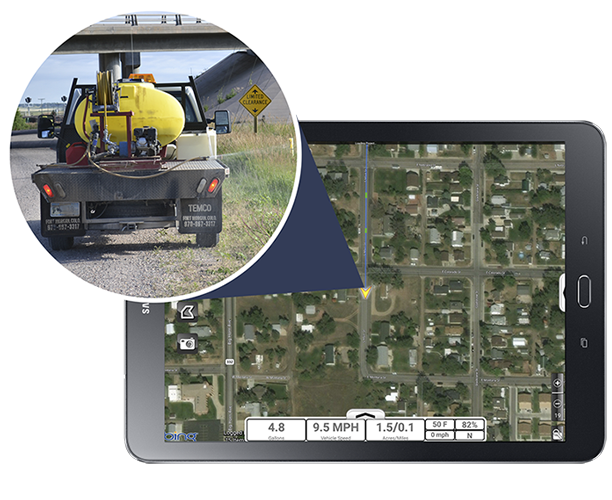 More spray time, less desk time, is a reality with this complete pesticide application mapping and reporting solution. We developed SprayLogger to keep you spraying and reduce the time it takes to creating maps and reports. SprayLogger automates the tasks of making the maps and reports your customers expect without the errors of pen and paper. Simply export the records you choose (using industry accepted GIS formats) and include a printable report (or invoice) containing every application details for those records. 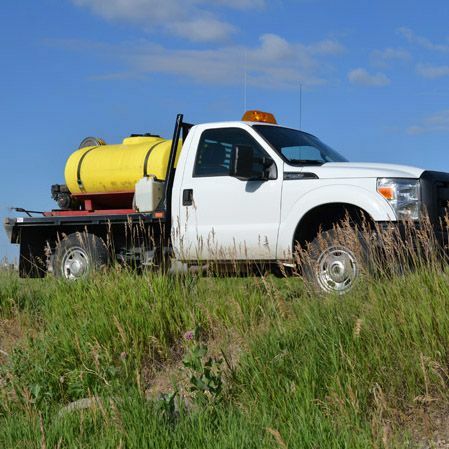 You can improve your efficiency in your weed control and vegetation management operations. For well over a decade AgTerra has enabled natural resource professionals to simplify data collection and reporting while delivering greater value to their customers. How can we help you? Contact us today and let us help you learn how easy and affordable our technology can be for your workforce and operations.